On the evening of Jan. 20 and early morning Jan. 21, the moon will undergo a total eclipse visible over all of the Americas. Today such a spectacle provides good opportunities to judge the clarity of our atmosphere based on the brightness and color of the eclipsed moon, to observe the Earth's shadow passing over prominent lunar craters, and to simply stare into the sky at a beautiful celestial show. But eclipses in the ancient (and not so ancient) past often terrified onlookers, who viewed them as evil omens. Sometimes they were used as benchmarks to date historical events, and one eclipse helped to better understand a now well-known concept of meteorology. In order to try and date the time of the birth of Christ, biblical scholars have tried first to date the death of King Herod, with whom the Wise Men consulted before their visitation with Jesus. According to the first century Jewish historian Titus Flavius Josephus, Herod was said to have died after an eclipse of the moon visible from Jerusalem ... and the birth of Jesus must have occurred before the death of Herod. The eclipse is supposed to have happened before Passover, so it would seem logical that we must search for an eclipse of the moon before the end of March, some have theorized (though Passover can also start in April). From lists of eclipses there is one that occurred on March 13, 4 B.C., and many have cited that the birth of Christ must have preceded that time. But this eclipse occurred at 5:40 a.m. local time in Jerusalem and was only 36 percent partial. Would this eclipse have been a good benchmark for Josephus? Perhaps Josephus was referring to a more dramatic event. In the after-midnight hours of Jan. 10, 1 B.C. there was a total eclipse of the moon. Totality was unusually long, lasting 1 hour and 39 minutes, and was widely visible throughout the Old World. In the December 1943 issue of Sky & Telescope magazine, Roy K. Marshall writes: "This eclipse is much more likely to have been observed. It is only a couple of months earlier in the year than the observance of Passover. Why could not the death of Herod have occurred in 1 B.C.?" To this day, attempts to date the death of King Herod continue to be rather contentious. Other researchers point toward other lunar eclipses to support their hypotheses. On his fourth and final voyage to the New World, as the story goes, Columbus and his men were for a time marooned and hungry on the north coast of Jamaica in the West Indies. The inhabitants were tired of supplying food in exchange for little tin whistles and hawk's bells. 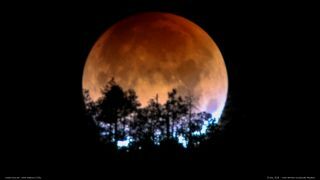 But Columbus had brought with him a copy of the Almanach Perpetuum written by the Spanish astronomer Abraham Zacuto, which predicted a lunar eclipse for Feb. 29, 1504. Knowing this, three days earlier Columbus threatened the Jamaicans that he would take the moon away if they didn't cooperate with his expedition. He wrote: "It began before sunset, so I could observe only the end of it, when the moon had just begun to return, and it must have been two and a half hours after sunset." The clear sky on the eclipse night exhibited what could only be interpreted by the Jamaicans as an inflamed (ruddy) and "angry" moon. When the frightened natives implored him to bring back the moon, the explorer stepped aside and pretended to pray. As the moon began to emerge from the Earth's dark shadow (the umbra), the grateful Jamaicans cheered and hurried away to bring food for the ill and starving men. Columbus' exploitation of eclipse ignorance likely inspired Mark Twain to use an eclipse in his story "A Connecticut Yankee in King Arthur's Court." The hero of the story avoided being burned at the stake by using a total eclipse of the sun to demonstrate his mystical powers. However, on the quoted date (June 21, A.D. 528) there was no solar eclipse at all; the moon was four days past full. Benjamin Franklin was an author, printer, politician, diplomat, inventor and scientist. He represented the unschooled original thinker and inventive genius so characteristic of many early Americans. Among his scientific interests was astronomy, and he no doubt was eagerly looking forward to the night of Nov. 1, 1743, when a total eclipse of the moon would be visible from his home city of Philadelphia. Totality would occur at a convenient hour, just after 9 o'clock in the evening, and it would last an unusually long 100 minutes. Franklin was perplexed. He felt that because the winds in Philadelphia blew strongly from the northeast — in the direction of Boston — that this was where the storm originated. "This puzzled me," he wrote, "because the storm began with us so soon as to prevent an observation; and being a north-east storm, I imagined it must have begun rather sooner in places farther to the north-eastward than it did in Philadelphia." Franklin began gathering weather observations from around Philadelphia and other locations and eventually determined the proper direction of movement for storm systems. In a letter in 1749 to clergyman Jared Eliot, Franklin pointed out that storms apparently occurred earlier in the region toward which the wind is blowing (a wind from the northeast is blowing toward the southwest) and began later for places in the direction from where the wind was emanating from. He later would write a treatise on the behavior of coastal storms along the Atlantic Seaboard. And to think it all began because he was deprived a view of a lunar eclipse! Thomas Edward Lawrence — better known today as Lawrence of Arabia — was a British adviser to the Arab Revolt against the Ottoman Empire during World War I. According to his writings, his small force of 50 Bedouin warriors succeeded in overrunning Turkish fortifications because on the night of July 4t 1917, the defenders panicked at the sight of a total lunar eclipse. They clanged copper pots and fired their guns into the air rather than at their attackers, presumably to frighten whatever was consuming the moon. As it turned out, the Turkish soldiers had other grounds for worry, as an Islamic tradition holds that the Day of Judgment will be heralded by a lunar and solar eclipse in the month of Ramadan, during which Lawrence's eclipse occurred. And finally, in January 1972, in the Lao People's Democratic Republic, villagers fired shots in the air in an attempt to frighten the great frog that they believed was trying to swallow the moon, according to the March 1972 issue of Sky & Telescope. I guess we can call this a "ribbeting" occurrence.